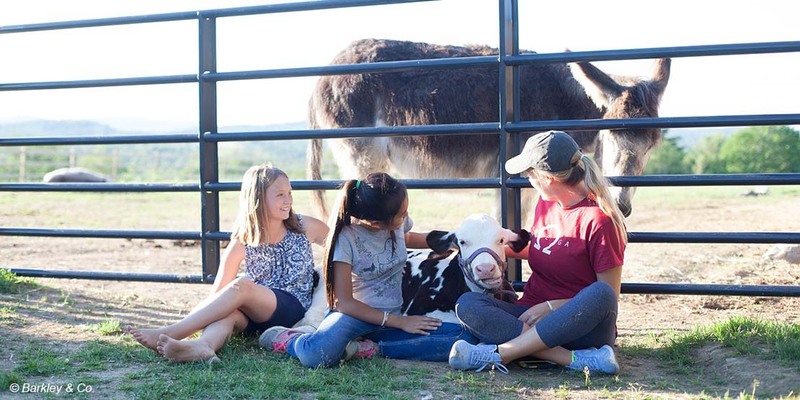 Situated atop a hill overlooking hundreds of acres of protected forests, Peace Ridge is a peaceful enclave of pastures and ponds, making it a haven for wildlife and farmed animals alike. Many of our residents love having visitors, and spending time with them is an experience you will not soon forget. We hope you will find the time to come visit us, and see what a truly special place Peace Ridge is! Visitors are welcome during our Open Houses, which are every other Sunday from June through October. Visit our Events page for the current schedule. No appointment is necessary for visits on Open House days, so mark your calendars and come see how life should be for farmed animals! Private tours are always available for our donors (weather permitting); we simply ask that you schedule your visit ahead of time. Not a donor? Visit our Donation Page and make arrangements to come see us! 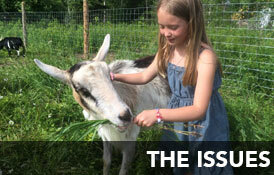 Most children have a special affinity for animals. Our tours for student groups offer the chance for young people to learn directly from some of our very special rescues, making the lessons even more memorable. Contact us at info@peaceridgesanctuary.org to schedule a visit.